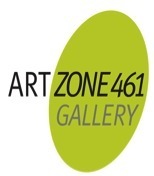 ArtZone 461 Gallery is pleased to announce two new exhibitions in concert with the SGC (formerly Southern Graphics Council) International 42nd Annual Conference in San Francisco. 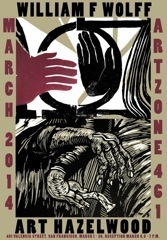 As a Host Gallery, ArtZone 461 presents a conference program highlighting printmakers from Poland. 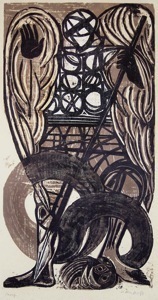 As a Participating Gallery, ArtZone 461 presents woodblock prints by William Wolff (1922-2004) and Art Hazelwood. While the Gallery represents the Wolff estate, this is Hazelwood’s first two-person exhibit. Hazelwood frequently contributed to previous group shows. William Wolff (1922-2004) was a native San Franciscan and a contemporary of first generation Bay Area Figurative artists: Though surrounded by members of the movement, Wolff never fully embraced it. 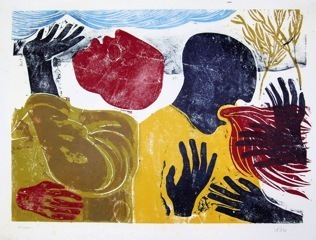 He became a printmaker after painting for over twenty years, during which he eschewed commercial recognition. 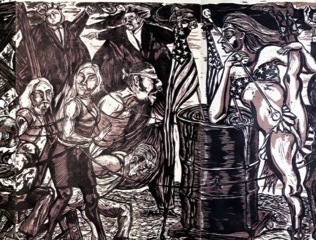 His paintings and prints represent a singular calling, expressing themes of myth, religion, history and social commentary. Art Hazelwood worked with William Wolff over the last eight years of his life as archivist, curator and friend. Delving into Wolff’s work so deeply profoundly influenced Hazelwood. 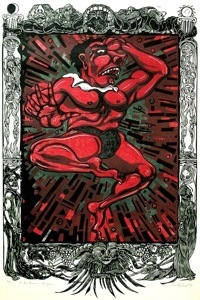 There are four major ways Wolff’s prints influenced him – the cutting technique of his woodcuts, his use of color, the boldness of expression and his use of literary themes. In this exhibition the works not only show Wolff’s influences but also presents his work in a new light.